The Day of the Dead (El Dia de los Muertos) is a celebration that takes place every year on the first and second day of November throughout Latin America, including in Guatemala. It is a day when Guatemalans remember their dead loved ones and celebrate that they were able to meet them or to be part of their family. It is believed that the souls of all of the people that have passed away return to Earth to check up on their families during this day. There are many traditions and legends attached to this celebration, plus there are a few different things that people do to commemorate their relatives. From visiting the cemetery to enjoying traditional foods like fiambre, attending a kite festival to communing with the dead at an altar known as an ofrenda, there are many ways to celebrate the Day of the Dead on your trip to Guatemala in November. However, while the Day of the Dead is celebrated throughout the region, the best places to go in Guatemala to celebrate this spirit-filled holiday are the highland villages of Santiago Sacatepéquez and Sumpango, which are both about a 30-minute drive from Guatemala City and host a huge Kite Festival each year. One of the most popular traditions among local Guatemalans on the Day of the Dead is to visit the grave sites of their loved ones. While some stick to putting flowers on the mausoleums and saying a prayer for the souls of the deceased, some families pack up all their food, put on their best clothing, and head over to the cemetery to spend the whole day and night visiting with those who have left. Tradition says that a plate must also be served to the ones being visited and are thus placed on the ofrenda while the rest of the family eats and celebrates. As the night comes, the cemeteries turn into big parties where the living relatives celebrate with the dead. Music and dancing accompany all-night feasting and communing with family both living and dead. When it is finally time to go to bed, locals must be careful with how they leave their homes at night. It is believed that spirits often come in the form of moths, which might get trapped in an open glass of water or burn in a still-lit candle, so families must make sure to extinguish any open flames and empty any water reservoirs hanging around the house. If a moth dies on The Day of the Dead, the spirit that came back in it would be trapped and unable to come back next year. Another popular tradition that takes place during the Day of the Dead is the Kite Festival, many of which are held across the country in big, open spaces where people gather to show off their kites, lift them up, and make them compete to honor the dead. What makes Kite Festivals in Guatemala unique is the size of the kites. People spend all year long building them and coming up with the design, many of which are 40 feet or larger, and the spectacular displays fill the air over cemeteries across the country. 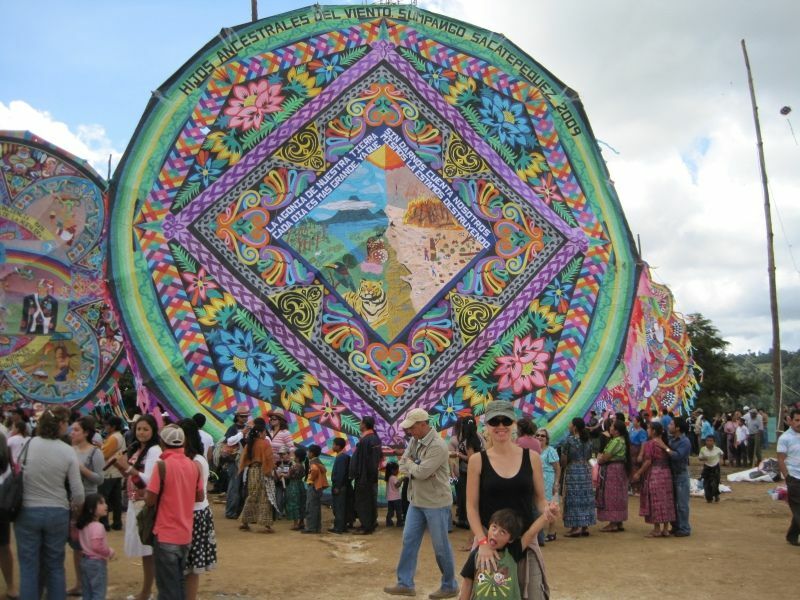 There are a few of these held Guatemala, but the most popular one takes place in a town called Sumpango, where you can also find tons of vendors offering all sorts of local dishes, handmade crafts, and even your own smaller kites to fly in the festival. If you have ever participated in festivals from any other corner of the world, you know that they are always linked to at least one dish that is made only during that time of the year. The Day of the Dead in Guatemala is no exception. A large percentage of Guatemala traditional dishes involve some variation of a stew, prepared with tons of spices, but on the Day of the Dead, Guatemalans also prepare something called fiambre, a weird and hearty dish with an interesting taste. It is made with a bunch of different vegetables, poultry, beef, pork, and fish, and in some cases, a few kinds of cheese and a sour kind of dressing are also added. Other traditional foods that are prepared on the Day of the Dead include tamales, ayote en dulce (sweet potato in milk), and pan de muertos, a sweet bread made especially for the holiday. Sugar skull candies and baked goods are also popular across Latin America. In all of these traditions, Guatemalans make sure to honor the four elements: earth, wind, water, and fire. At the cemetery and on their ofrendas, families burn candles to help guide the deceased back to the land of the living and represent fire. Water and earth are represented in the food and drink offered to the dead, including fiambre and tamales; additionally, the cempazuchitl (marigolds) that are used to decorate the graves also symbolize the earth element. Guatemalans use papel picado—cut out tissue paper used in the kite festivals and in the home—to represent wind and air.